Between 1848 and 1849, whispers of gold in California became a roar. The gold rush was on, and thousands established rough camps in the western foothills of the Sierra Nevada. 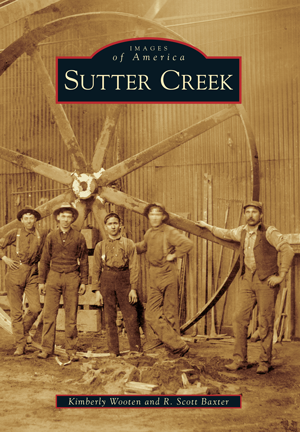 Among these camps, nestled in a small valley, was Sutter Creek. The town is named for the famous John Sutter, whose discovery of gold at Coloma started the rush. And though many gold-mining tent cities died out over time, Sutter Creek transitioned to a solid community with wide streets, two-story businesses, and beautiful homes. Blacksmiths, foundries, and other industries provided services to the ever-deepening mines, among the world's richest. Settlers used the ideal soil and climate to produce crops and livestock, gradually replacing head frames and hoist works, as the last mine finally closed in the 1950s. Thousands still journey to Sutter Creek, some for gold, but most are attracted by the rich heritage still visible along historic Main Street. In this collection of vintage photography, culled from personal collections and the Amador County Archives, historical archaeologists and husband-and-wife team Kimberly Wooten and R. Scott Baxter bring to the reader a unique perspective. The authors also bring a deep community connection to the area, where their children are sixth-generation natives.